Home / Npower / NPowerNG / Npower Volunteers Deployment Letter Upload Rejection Solutions. Npower Volunteers Deployment Letter Upload Rejection Solutions. If the deployment letter you uploaded on your profile reads not approved that you should rescan and upload it again, then there is probably|y a problem with what you scanned, possibly not readable. So, you have to redo as specified on you profile. According to Npower, they have a list of where every beneficiary has been assigned. If you upload a letter from a different place of assignment, they will know. So, Kindly upload the letter from where you were originally assigned to. PPA on your letter does not tally with the PPA Npower have on their record. If you are reposted, kindly have your PPA head Indicate on your deployment letter. Kindly visit your PPA head for clearance/acknowledgement with stamp and signature. If your own case is signature and stamp, kindly visit your PPA head and do as instructed on your disapproved letter. 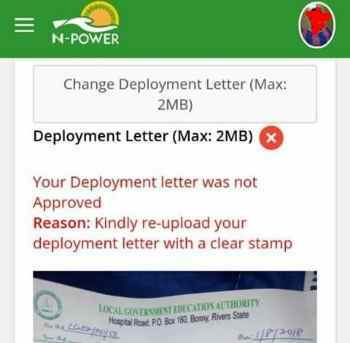 You need not panic if your deployment letter was disapproved, Npower will specify the reason and you will be asked to upload another one, make sure you do it right this time. Make it a habit to be checking your NPVN profile from time to time, should in case there's a need to effect a change. Validation process still ongoing.